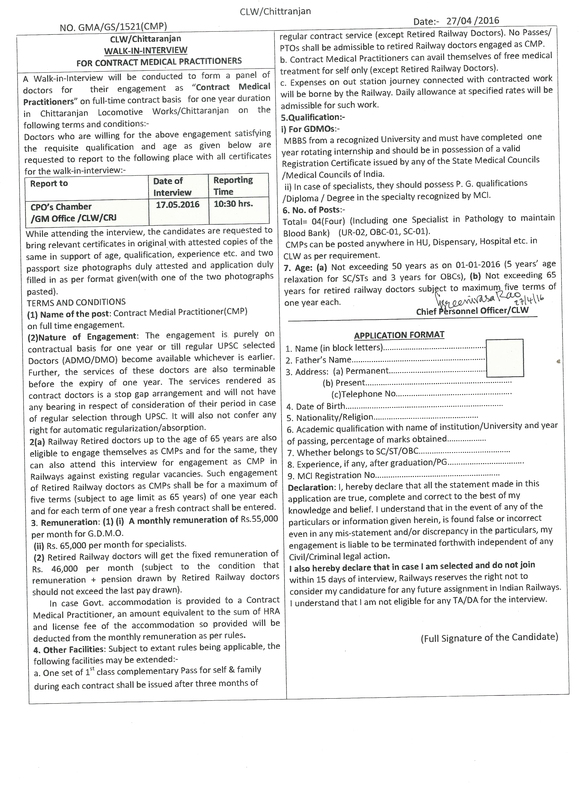 Chittaranjan Locomotive Works invites application for the post of 04 Contract Medical Practitioners on full-time contract basis. Walk-in-Interview 17 May 2016. Educational Qualification : MBBS from a recognized university and must have completed one year rotating internship and should be in possession of valid Registration Certificste Issued by any of the state medical councils/ Medical Council of India. And in Case of Specialists, should passed Post Graduate qualifications/ Diploma /Degree in the Specialty recognized by MCI. How to Apply CLW Vacancy : Interested candidates may appear for Interview in prescribed application form along with relevant documents, experience certificate & two recent passport size photograph at the time of Interview. Venue of Interview : CPO’s Chamber / GM Office/ CLW/ CRJ Chittaranjan. Chittaranjan Locomotive Works invites application for the post of 03 Scouts & Guides Quota. Apply before 08 February 2016. For Group ‘C’ : Candidate should be a President’s Scout/Guide/Ranger/Rover OR Himalayan Wood Badge (HWB)Holder any section And Passed 12th or its equivalent examination with 50% marks from recognized Institutions. For Erstwhile Group ‘D’ : Candidate should be a President’s Scout/Guide/Ranger/Rover OR Himalayan Wood Badge (HWB)Holder any section And 10th Pass or ITI or equivalent from recognized institutions. Selection Process : Selection will be made on Written Test, Scouting – Skill Assessment & Marks on Certificates. Application fee : Candidates belonging to General/OBC have to pay Rs. 100/- through Indian Postal Order (IPO) drawn in favour of FA & CAO, Chittaranjan Locomotive Works. SC, ST, PWD, Women, Minority and candidates belonging to economically backward classes(whose family income is less than Rs.50,000/-per annum) are exempted from the payment of fee. How to Apply : Interested candidates may apply in prescribed application form along with attested photocopies of relevant documents send to Astt. Personnel Officer(Genl), Chittaranjan Locomotive Works, Chittaranjan, Dist: Bardhaman (West Bengal), PIN 713331 on or before 08.02.2016.